Historical nonfiction author David Price was on campus last week speaking with first-year seminar students about his 2003 book, Love and Hate in Jamestown: John Smith, Pocahontas, and the Start of a New Nation. Price’s book was the Common Reading Experience for Lynchburg’s Class of 2022. The Common Reading Experience is a tradition at University of Lynchburg. Past selections have included All Quiet on the Western Front, Fahrenheit 451, The Fault in Our Stars, A Lesson Before Dying, and others. Price met with the first-years on Friday, September 21, at Sydnor Performance Hall. He told the freshmen that he was “happy to hear [his book] was the first assignment for the freshman class” and that its selection was “very meaningful” for him. 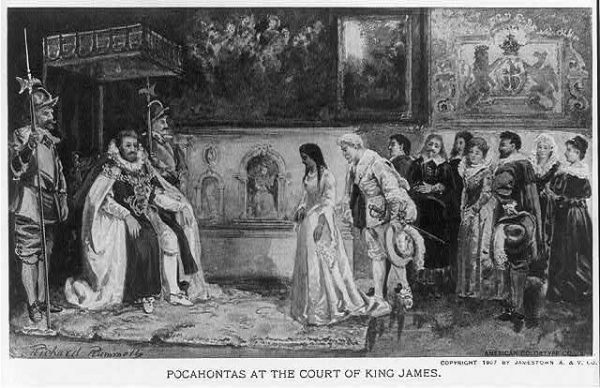 Rummels, R. (1907) Pocahontas at the court of King James / Richard Rummels; American Colortype Co., N.Y. England Jamestown Virginia, 1907. Norfolk, Va.: published by the Concessionaire, The Jamestown Amusement & Vending Co., In. [Photograph] Retrieved from the Library of Congress, https://www.loc.gov/item/2002719456/. During the lecture, Price talked about the Virginia Company, the London-based company that founded the Jamestown settlement in the early 1600s, and about liberties that have been taken with the Pocahontas story. He showed the freshman an image from the Disney film Pocahontas of a romantic moment between Pocahontas and John Smith, a prominent figure at Jamestown. Price said the image could have a three-word caption: This never happened. In reality, Pocahontas married another Jamestown settler, John Rolf. “John Smith and Pocahontas have been subject of lots and lots of artistic license,” Price said. Price also talked about what he considers to be the most important themes of the Jamestown story: the role of corporations; the emergence of social equality as a value; the early, optimistic relationship between Native Americans and Europeans; the starting point of the black experience in America; and the introduction of the English tradition of liberty to the new world. Love and Hate in Jamestown was a New York Times “Notable Book of the Year” and a School Library Journal “Best Adult Book for Young Adults.” Price also is the author of The Pixar Touch: The Making of a Company and a forthcoming book about World War II code breakers. Price’s lecture was one of several first-year seminar lectures that are planned this fall in conjunction with American Evolution, Virginia to America, 1619 to 2019. American Evolution is a series of events, legacy projects, and initiatives that celebrate the 400-year history of the Commonwealth of Virginia. Lynchburg is a higher education partner of the commemoration. Each lecture in the first-year seminar series is aligned with one or more of American Evolution’s themes: democracy, diversity, and opportunity.